For the lovely mamas and hopeful mamas in your life that truly deserve to be celebrated oh so well. Or single or triple! Stamped with the initials of each of their kiddos. Stamped with mama, mama bird, or mama bear. For the mama who is so proud of who she is and the kiddos who call her mama. First time mamas especially love this! A piece of jewelry that can’t be grabbed or pulled on by cutie kiddos! I’ve made the sweetest sets with names, birthdays, and initials. They are gold filled or sterling silver so they won’t tarnish and can be kept on at all times. These are a sweet, yet subtle way to always have something reminding them of their children. For the mama who loves her kiddos, but maybe just isn’t a fan of your typical name necklace. 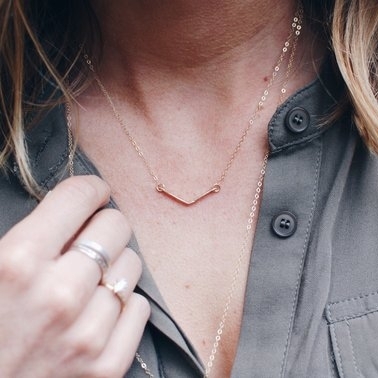 This dainty piece keeps precious names hidden and close to her heart. I have made so many of these for mama’s who have lost a precious baby due to a miscarriage. It is a wonderful way wear the name to remember their sweet child without everyone seeing it and asking questions. It’s a hidden, secret, and sacred necklace. This is also a great gift for a hopeful mama in the wait, stamped with the word “mama” as a declaration and hope of what is coming. A sweet way to remember those little details that mean so much! For other ornament customization ideas click HERE.